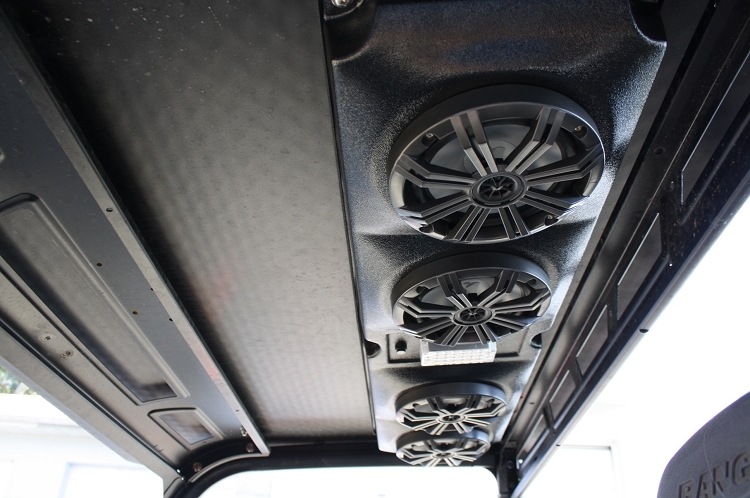 Designed to be able to install 4- 6.5" speakers. This is the perfect speaker bar if you have the room and want good and loud music! There is internal room for a small amplifier, check with us for details. We designed this model for universal bolting with a total of (6) mounting pads. This unit can be suspended using spacers, or you can fabricate simple mount brackets that will pick-up the (6) mounting points. Roof mounting is also possible using a set of 1,1/4" threaded spacers, we offer this as a complete hardware package. We also offer this unit for various manufactures Side By Sides along with specific roll cage mounting kits. 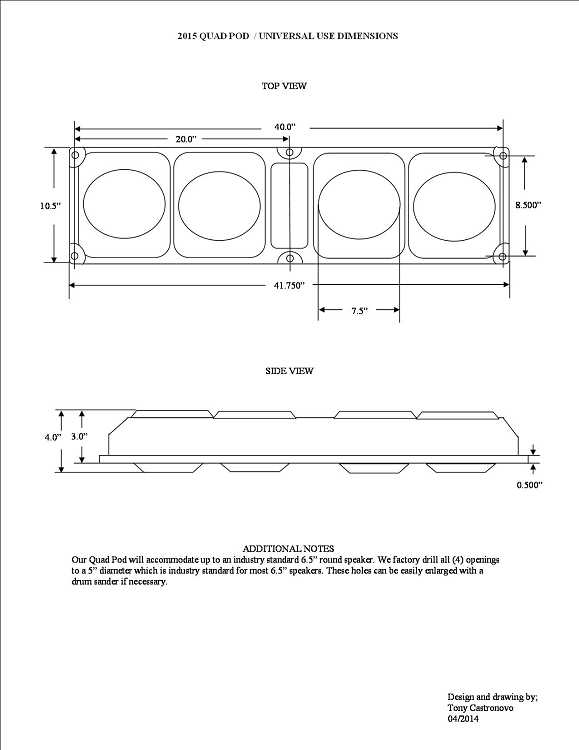 See "OPTIONS"
This speaker bar features a removable back cover with it, and the housing is re-enforced with integral structure for both added strength and rigidity. The back cover has a foam rubber seal to keep dirt, water, and debris out. You can order this speaker bar with speaker cut-outs or no cut-outs at all. We offer the most common hole cut-out diameters, 5.5" O.D. If you are not sure the exact diameter of the cut-out hole and require one ,(6.5" refers to speaker cone diameter not hole cut-out size) we drill 5.5" which can be used for most all 6.5" speakers. NOTE: FOR EXACT DIMENSIONS CLICK ON "IMAGE GALLERY"
NOTE: SHOWN ASSEMBLED WITH KICKERS SPEAKERS AND LED CAB LIGHT, AVAILABLE "SEE OPTIONS". CUSTOM MOUNT KITS AVAILABLE FOR UTV'S "SEE OPTIONS"
Top notch product from top notch people. You will not be disappointed.